I've wanted to play guitar as long as I can remember! When I was four years old I would carry around random objects and insist they were guitars. Finally by the time I was nine years old I was big enough to hold one and my parents found a great teacher. So I've been playing for 12 years or so, graduated from Berklee and now live in NYC. I started out really a rock and blues player and then got into jazz when I was around 15 or so I had rock bands in high school and we did tons of original material. Then I met some guys that were in the high school jazz band across town and they really got me into it. I really fell in love with jazz and when it came time to pick a college I was easily seduced by the Berklee College of Music in Boston. I studied jazz guitar pretty hard there, from straight-ahead to really out there with some amazing teachers. I was definitely lucky to work with some of the best musicians in the world at Berklee. Since then I've been back playing in pop groups whist I play jazz on the side. I love it cause my heart is in many kinds of music. Now I feel like Im striking an honest balance of jazz and other styles. I definitely feel that comes out on this record. 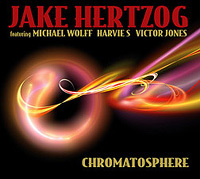 It's called Chromatosphere and it's my take on a modern, but not avant-garde, jazz guitar record. There's hints of different kinds of jazz on there, from fusion to R&B to straight ahead and world. I feel like each tune is a different aspect of what makes up modern jazz, like different points on the same sphere. It's my first record, so Im really excited about all the places I can go from here. 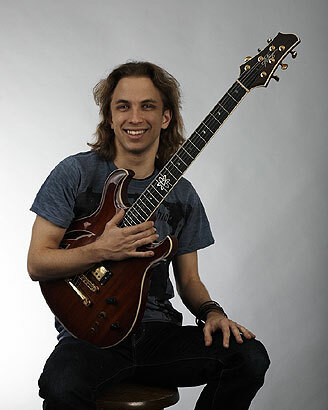 I think my guitar style is to blend all the things I like and particularly with jazz to play as differently as I can. Another concept of the record was that each tune should be something the average person could enjoy, without needing a music degree. So much of jazz is musically so complex and though I love it, my rule is, if my mom wouldn't like it, most people would turn it off. So I tried to make a record that had some musical slickness but that wouldn't intimidate people with its complexity or sonic chaos. My favorite is my Artinger Custom, which I used on the entire record and most of my gigs. It is semi hollow but extra small, with coil tap pickups for huge sonic range. I also use lots of effects, primarily delay, chorus, pitch shifting and distortion on this record. I like to use harmonizers and anything that simulates more than one guitar. I love the way U2 uses delays and I hope to do something like that on my next record. I also have a beautiful custom Les Paul and Fender Strat that I use on my pop gigs. Same batch of effects really, just much more traditional ways of using them. The Fulltone distortion pedals sound amazing! Good question! Im a diehard Pat Metheny fan. I love everything from Bright Size Life to The Way Up. I just think he's so musical and his artistry is so poetic. I like musicians that are so far beyond just playing the guitar in a cool way. John Scofield as well. And then all the other jazz dudes, Wes, Joe Pass, etc.. I really like Ben Monder's music too, it's so creative. Flux is an incredible guitar album. But Im influenced by pop artists too, since I'm also a singer songwriter. U2 and Jimi Hendrix, 90's alternative and anyone who writes a great song. I want to make that kind of jazz that's new but also listenable. I think all guitarists are influenced by Electric Ladyland and Layla and all those great classic rock records. And some of the jazz records like Smoking At The Half Note by Wes and Virtuoso by Joe Pass. Those are timeless. The Joshua Tree is one of the coolest guitar records ever, I think, so original.